New contactless donation points to fund the SOS Bristol night shelters for people sleeping rough have now launched at Ocean Estate Agents in Bishopston and Southville; marking an increase in this innovative approach to supporting homeless people in Bristol. Shoppers in Broadmead and the new locations will be able to ‘touch’ their bank card to give £2 instantly to the SOS Bristol campaign. No data will be stored in the units or by any of the charities. The donation will appear on your bank statement as St Mungo's but will be allocated across the partner charities in line with the campaign information below. Processing fees incured on your £2 donation are between 1-3% depending on your payment card/method. For donation assistance please contact supporter.care@mungos.org. In 2011, the number of people sleeping rough in Bristol on any one night was less than 20. In November 2017 this number was up to 86. Bristol Rough Sleeping Partnership (RSP) was set up by Bristol City Council in November 2015 to tackle the problem of street homelessness in the city. St Mungo’s, The Julian Trust, Caring in Bristol and Crisis Centre Ministries are members of the RSP and work together to run the city’s night shelters. The wider partnership also includes Avon & Somerset Police and the Golden Key Programme, as well was work to engage businesses and developing a ‘One City’ approach to tackling homelessness and rough sleeping. Night shelters are a key area of the partnership’s emergency response work. In 2015 there were 30 emergency night shelter beds across the charities but these were not enough and rough sleepers were being turned away at the door. Something needed to be done. In 2015 the RSP was established and through this vital partnership, we have been able to respond quickly to the increasing need for emergency shelter across Bristol. In January 2016, we were able to open two new night shelters run by the charities St Mungo’s and Caring in Bristol. This has provided 35 extra shelter beds, bringing the total across our four night shelters to 65. St Anne's shelter will be open during the Winters of 2018 and 2019 which will increase capacity by an extra 30 beds during these times. Bristol City Council currently funds 1,100 beds in hostels and supported accommodation which helps people when they have moved away from the streets, but sadly around 86 people continue to sleep rough each night. We know that night shelters aren’t the only solution to this crisis. 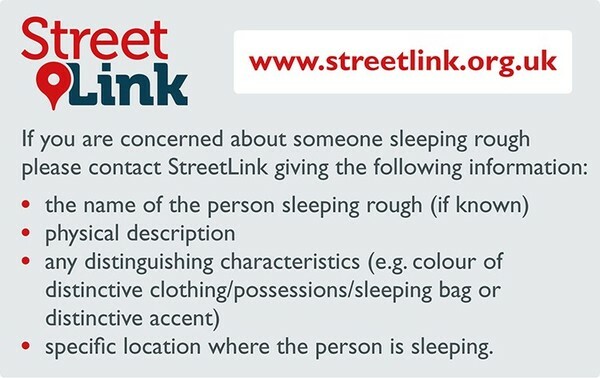 The RSP have pledged to work together to provide further emergency as well as longer term responses to tackle the rise in rough sleeping in the area. 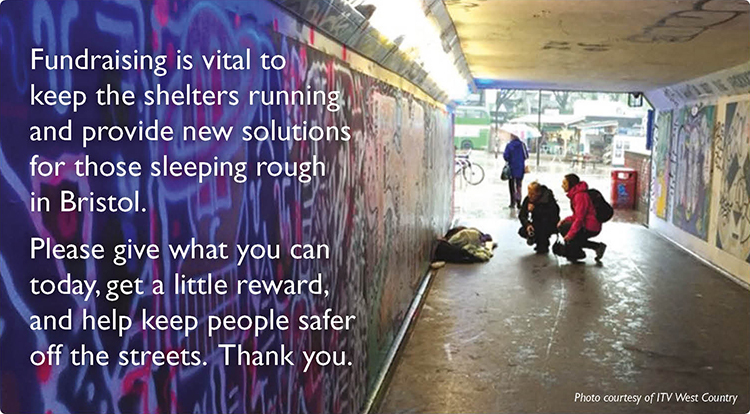 Please give what you can today, get a little reward, and help keep Bristol night shelters running. Thank you. We are asking our local community to get behind our Safer off the Streets campaign and help to bring someone out of the cold. We hope you will join other people in your community and help to raise the £100,000 we need to help keep our night shelters running. We can’t do it without you. If just a third of adults in Bristol donated £1 we would reach our £100,000 target. 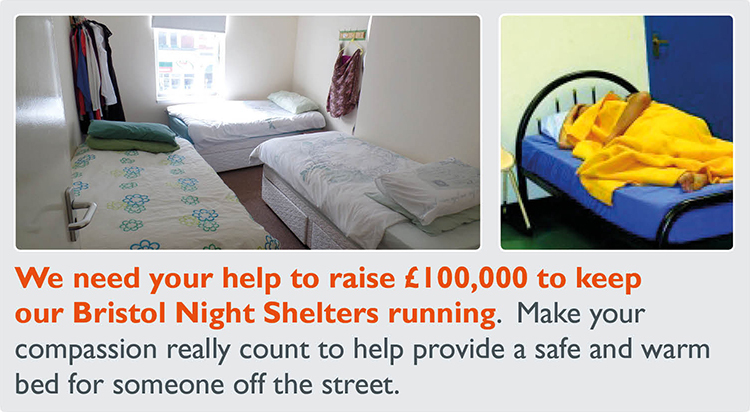 Please donate to Bristol's night shelters, get a little reward, and help people be safer off the streets. Thank you. Please help us to spread the word and share this campaign, so that more people know how to help homeless people in Bristol. Thank you. Net proceeds of this campaign, will be distributed to the charity partners as follows; St Mungo’s 46%, Julian Trust 18%, Caring in Bristol 18% and Crisis Centre Ministries 18%. The Gift Aid claim made by lead charity St Mungo's will also be split based on this allocation. £8,300 – You could pay for the costs of the whole Bristol night shelter programme for one week. You could help ensure that hundreds of people have a safer alternative to sleeping rough whilst we work on more secure and permanent housing options with them.